Michael Contegni/Staff Photographer Sophomore guard Timmy Rose scored a career-high 21 points in BU’s 63-55 loss to UNH. The only happiness that emanated from the Binghamton men’s basketball team’s bench came from the faces of junior forward Caleb Stewart and freshman guard Tyler Stewart — two redshirts smiling and cracking jokes at the end of it. The rest of the bench, though, looked down with despair as the clock wound down in the Bearcats’ 63-55 loss to New Hampshire on Sunday afternoon, a stunning reminder of how cruel college basketball can be. After leading by as many as 21 points in the first half, BU (12-16, 3-10 America East) fell apart in the second. 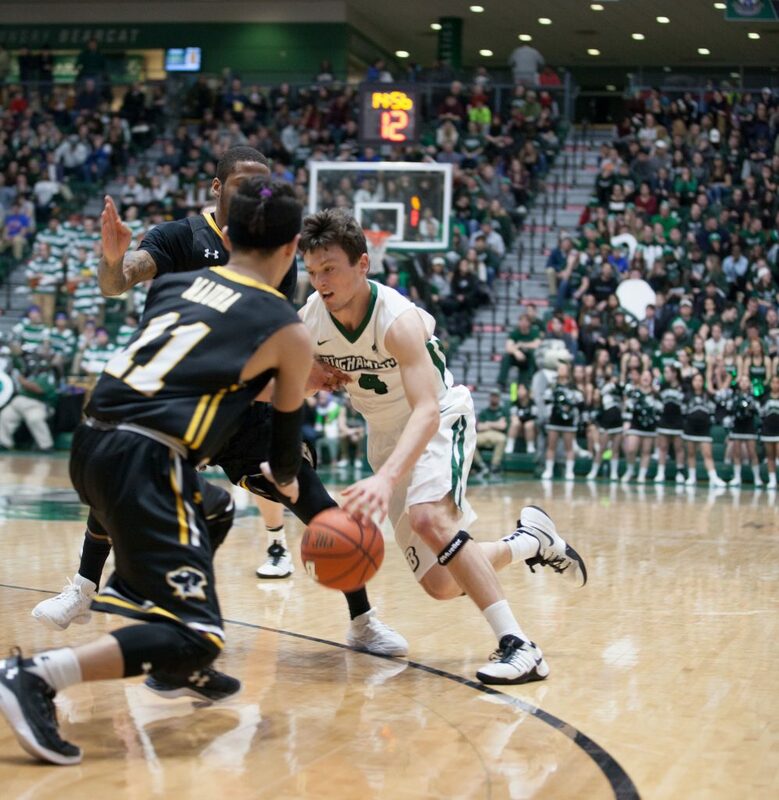 The Bearcats struggled to communicate on the court, fumbling passes before field goals were even attempted. In the final 20 minutes, BU shot just 24 percent from the field, compared to a 50 percent clip in the first. While BU faltered in the second, the Wildcats (15-11, 6-6 AE) pounced. UNH slowly inched its way back into the game, finally tying BU after senior guard Jaleen Smith hit a highly contested jump shot from inside the paint with 7:56 left. Less than a minute later, New Hampshire embarked on a 14-4 run to close out the game. After leading for the first 33 minutes, the Bearcats failed to keep pace, losing their fifth straight game in the process. Early on, BU’s press stumped the Wildcats. The Bearcats forced eight of UNH’s 10 turnovers in the first half before they were forced to back off in the second half with a lack of depth. BU’s lethargic performance in the second half was amplified by foul trouble and injuries. Slipping closer and closer to fouling out, senior guard John Rinaldi and sophomore forward Thomas Bruce found themselves bogged down by fouls, limiting their minutes in the period. After battling the flu for much of the past week, junior forward Willie Rodriguez tallied just three points in 25 minutes. Junior forward Bobby Ahearn sat out for the second straight game with a broken nose. Sophomore guard Timmy Rose led BU in scoring against UNH. He tallied 21 points in 31 minutes on the floor, shooting 3-for-7 from beyond the arc. This season, Rose has averaged 7.4 points per game. Against New Hampshire, Dempsey fiddled with the Bearcats’ typical starting lineup. Rinaldi started a game for the first time in 99 career games, and sophomore guard John Schurman played 14 minutes despite averaging 5.2 minutes per game so far this season. BU is set to continue AE play against Stony Brook on Saturday. Tipoff is scheduled for 7 p.m. from the Island Federal Credit Union Arena in Stony Brook, New York.